Modern ½ crushed morocco over cloth boards. 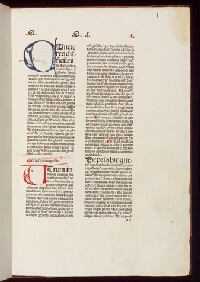 106 leaves; two large initial capitals in blue and red on a2r; paraph marks and initials in blue and red; occasional contemporary and 17th/18th-century scholarly marginalia (sig. k7r etc. ).